Actually, this is probably one of our favorite holiday traditions in general. I do this for several holidays (Halloween and Christmas, of course, plus a smaller bit for Thanksgiving, St. Patrick's Day, etc). It's time to bring out the big basket of Easter books! When Faith was really little, we happened upon Barnes & Noble, shortly after Easter. They had all their Easter books marked for 75% off, so we bought her a whole bunch that year. But, since she was little, and the books were holiday books anyhow, we tucked them away till the next year. We did the same thing after Halloween and Christmas too, and built up a huge collection of holiday books. The next year, when we brought them out, she was fascinated with all the new books and we read them over and over leading up to Easter. After Easter was over, we decided to put them away again, to save them for the next year. Sure enough, the next year, it was like we brought out a whole new bag of books. 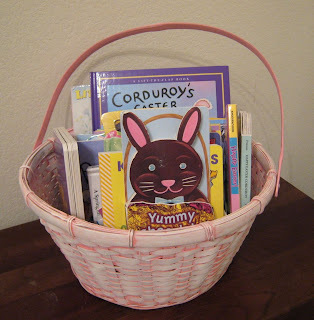 Both kids have been waiting for the Easter books to come out, so the 30 or so books are now officially out of the box and in the basket in the guestroom, until I move them downstairs for reading for the next week or so. I love when my plans work!